The Sea Ice Action Network, supported by the Study of Environmental Arctic Change (SEARCH), advances awareness and understanding of Arctic sea-ice loss by enabling collaboration, community engagement, and communication. The extent of arctic sea ice in summer is disappearing faster than 10% per decade, while rapid thinning has reduced the total ice volume by 60% over the last 30 years. These changes alter marine ecosystems, promote increased coastal erosion, threaten the resilience of Arctic Indigenous Peoples, accelerate warming, and influence global weather patterns. Yet, less sea ice may also create opportunities for shipping, tourism, and other industries. On these topics, we aim to highlight the related science, share diverse perspectives, and encourage more sophisticated discussions. "Light is flooding into the Arctic. There will be winners and losers. That’s what brought an international group of scientists to the Barents Sea to investigate how plant and animal life will adapt to the new normal. Two key factors that govern the arctic ecosystem are rapidly changing: ice and light. The Arctic is the fastest warming place on earth, and ice that used to form on the surface of the ocean is vanishing. That’s threatening species large and small that rely on it, but it’s also created an opportunity. Less ice means more light reaches the underwater ecosystem, benefiting the algae that anchors it as well as apex predators like whales and seals." This video is part 1 of a 3-part series on the changing Arctic. The amount of sea ice in the Bering Sea during winter 2018 was the lowest since 1850. The sea ice cover in the Bering and southern Chukchi seas got off to a remarkably late start during freeze-up in fall 2017, which was followed by the Bering Sea experiencing vast stretches of open water and stormy conditions throughout winter, which had substantial effects on coastal communities in the region. 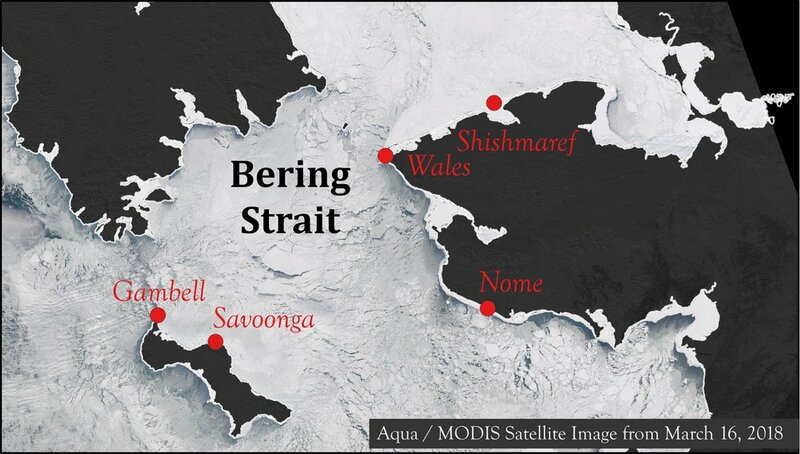 This report, led by the International Arctic Research Center (IARC), briefly summarizes recent observations from community members and researchers, and begs the question of whether the Bering Sea is entering a "new normal" state of low winter sea ice conditions.